Curtis Kent is one of my favorite demo guys on the interwebs. Curtis is also one hell of a nice guy. I remember calling him up once with some questions regarding Matchless amps and boost problem I was having and he fired a bunch of suggestions that helped me out greatly. If you’re not familiar with his channel, please subscribe, because he’s great! Over the last few months, Curtis slowed down his demos, but I was very excited that he was getting back on it recently! A few days ago, I came across his demo of his Temple Audio Trio 28 Pedalboard. 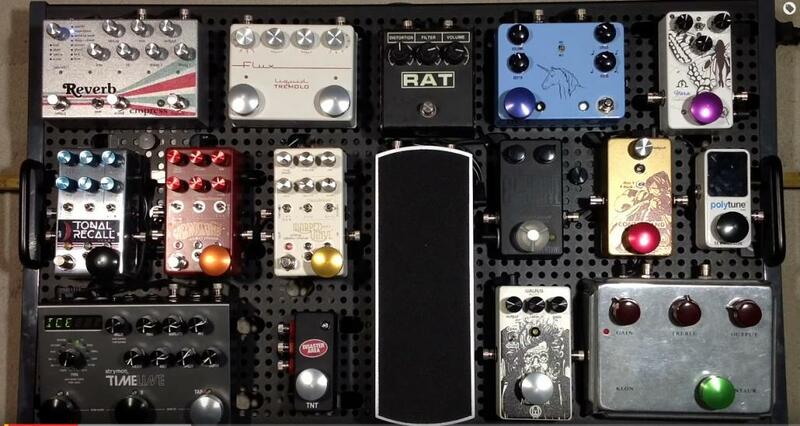 What immediately struck me about this board was the look and layout and therefore I wanted to share what he has going on. Okay, let’s check it out! The Temple Audio Trio 28 board is a great design. I like the system for mounting pedals, because it presents the pedals in a very clean way. As you see, there are some big footswitches added to some of the pedals on board. Personally, I could use a few of these on my commonly used pedals – or with pedals that have switches next to each other, since it’s easy to step on both switches by accident. These footswitch add-ons are from Barefoot Buttons. Basically, they are milled pieces of aluminum that sits on your existing footswitch and is secured with a set-screw. Great idea! Here is the breakdown of Curtis’ pedalboard. Great stuff! As you can see, this is board is simply awesome. Let me know what you think by commenting below! DAMN! That is one hell of a board!